The majority of people are in agreement that rats are some of the most abhorred pests that the world of flora and fauna has to offer. They made a name for themselves on the international stage for all the wrong reasons in the 14th century for the enormous part they played in the Black Death or what is also known as the Plague. This was responsible for an estimated 75 to 200 million deaths in Eurasia, and although in current times rats cannot match their predecessors in such feat of epic destruction, they still remain a force to be reckoned with. They are classified together with mice and other gnawing animals like beavers, squirrels and hamsters as what we call rodents, in the order Rodentia in the Class of mammals as per the taxonomic units. This widely-used name has its root in the Latin word rodere which means to gnaw which means “to gnaw or corrode” and it is owing to the fact that their upper and lower incisors are comparatively large, chisel-shaped teeth adapted for precisely this mode of feeding. To add to their repertoire that makes them such a menace, these infamous creatures are also referred to as commensal animals, meaning they depend entirely upon human beings for shelter and nourishment. Needless to say, they are not the easiest nor most pleasant of animals to deal with, even though some particular types are kept as pests. 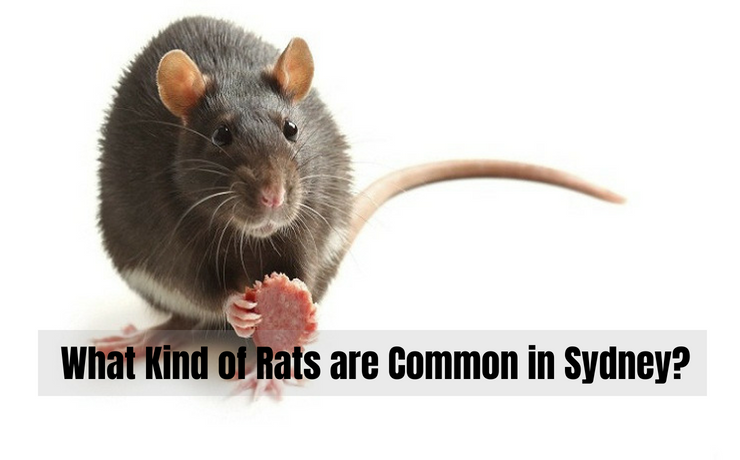 In Sydney, whether you live in the suburbs or are based in its metropolitan areas, you are confronted by this unfortunate reality that cannot be escaped; Rats. They are present in large numbers like an army of small but dangerous foes which form a ruthless and potent whole. They are divided most commonly into two types of rats that are present in Australia. The first and more common variety is the black rat (Rattus rattus). They have also earned the alternative names roof rat or ship rat. Now, these are the ones that are most likely to be seen on the streets, on roofs and within their own abodes, a sign that you need to take residential pest control measures. Their outward appearance is characterized, as the name suggests, by a colour of fur ranging from black to dark grey to a deep brown. Other notable features include a pointed nose, ears and eyes and a streamlined body. In addition, it has a tail that is much longer than its whole body length. As for its life cycle, black rats produce 5-10 young for every litter and have between 3 and 6 litters a year. They have about a 3 week gestation period and take between 12 to 16 weeks from birth to reach sexual maturity. As per their habits, they are very agile and excellent climbers, giving them that edge that makes them an ever so elusive target.Their preferred food is moist fruits, and they will drink around 15ml and eat 15g of food a day, which is significantly less compared to what a brown rat consumes in a day. As for the brown rat (Rattus norvegicus), which is also known as the Norwegian rat,it is the species that tend to be kept as pets in homes. They are also the species that is used in scientific research experiments in laboratories. You may have come across the term “lab rat”, a term used colloquially. It is a phrase coined out of this particular species. On their external appearance, they are the heavier set of the two species and are covered in coarse fur that is red-brown in colour. The brown rat is up to 40 cm in length, with a tail shorter than the head and body. It grows up to between 350–500g in weight.It has a blunt nose, small ears and a thicker body when compared to the Black Rat (Rattus rattus). In addition, these rats tend to have 7 to 8 offspring per litter and between 3 to 6 litters a year. 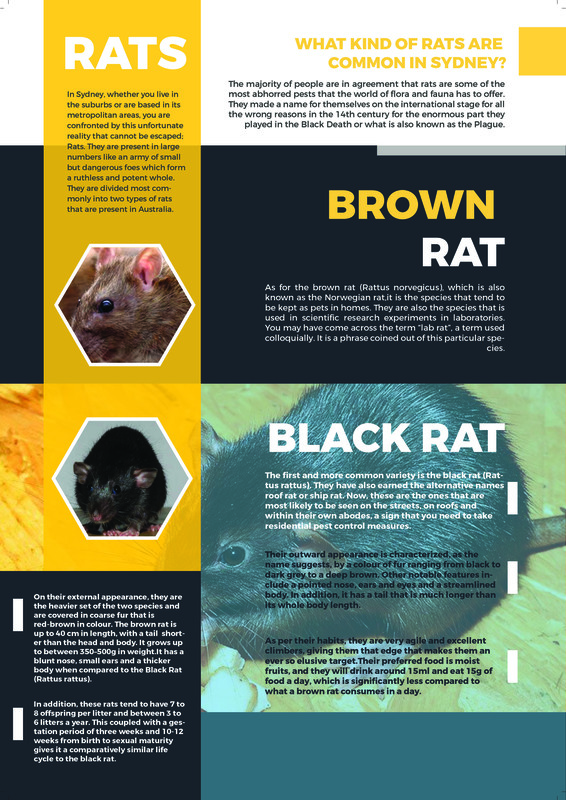 This coupled with a gestation period of three weeks and 10-12 weeks from birth to sexual maturity gives it a comparatively similar life cycle to the black rat. As for its habits, they tend to be less destructive, eating mostly cereals even though they are mostly omnivorous. They tend to drink 60 ml and to eat about 30g of food. If these rats are giving you a hard time then you should definitely enlist the services of pest control in Sydney for an effective job in ridding yourselves in these rats. How Does Pest Control Work with Your Pets?